As reported in Today, we have to share this heartwarming Mother's Day tale especially for pet lovers. On April 5, Michael and Beth Clark of Maryland gave birth to a beautiful baby daughter named Hazel. 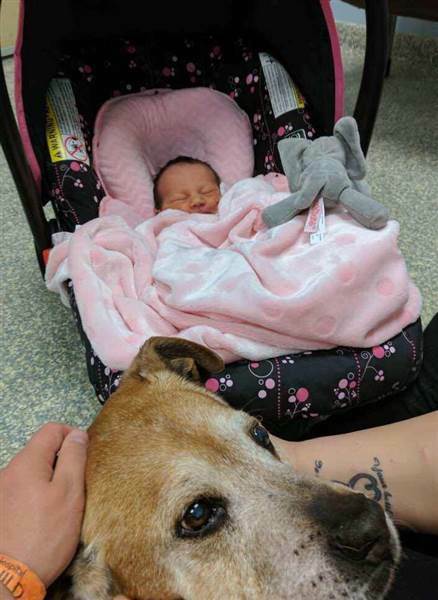 With the joy of their daughter's birth, also came a bittersweet ending to a tale of incredible kindness and compassion. In 2015, Beth Clark and her husband saw an elderly 17 year old dog that had been dumped at their local shelter. Unfortunately this is what a LOT of pet owners do. They abandon their dogs when they get sick or old. Many potential adopters pass by older pets in shelters. 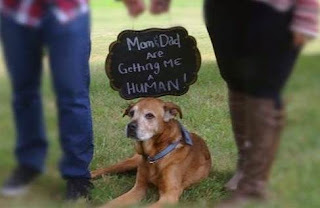 But this incredibly kind and special couple opened their heart to this loving, sweet dog. The Clarks couldn't let this gentle soul die in the shelter so they brought home this skinny, gray, frail dog and gave him the love and nurturing he needed. Beth nursed him back to health. Beth had enough motherly love for more than one and longed for a human child. She became pregnant but lost the first baby to a miscarriage. Then, she became pregnant again shortly thereafter. Throughout this, time Rocky was Beth's caring companion and offered her great comfort. He was always near and by her side. Rocky was even there to help Michael and Beth spread the news when they learned they were pregnant with Hazel. During Beth's seventh month, Rocky’s health began to decline. The Clarks did all they could to keep Rocky happy and comfortable. The days passed and Rocky watched the baby items move into the house. Then finally, the day came for Beth to become not only Rocky's mom, but a Mom to his new “human” sister too. On April 5, 2017 Beth gave birth to her daughter, Hazel. She and Michael returned home the next day and were so excited to introduce Hazel to Rocky. Rocky sniffed Hazel and put his head near hers. The homecoming was special and included priceless photos of Hazel and Rocky. Within a few hours after they came home, Rocky's condition worsened and he let them know it was time for him to go. Rocky hung on until the very end waiting to meet Hazel and to make sure that everything would be ok for Michael and Beth. That night they helped him end his journey peacefully surrounded by the family who loved him. Beth believes that Rocky was “just waiting to see his new baby sister” before he finally let go. I am sure Rocky’s tail is wagging, knowing that Beth has baby Hazel to celebrate on this Mother’s Day.